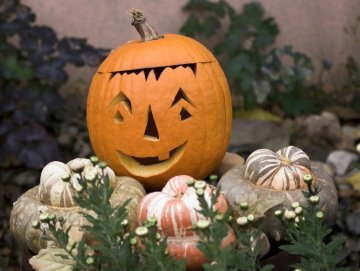 Halloween is a fun time of year for all ages, but the costs can be prohibitive if you go overboard. Between decorations for the house, yard, party table, party foods, candy handouts, and costumes for every member of the family, it can get really expensive. If you have leftover decorations from last year, pull them out and see what they need to be reused. Sometimes a little spiffing up is enough. Some items will need to be cleaned. If you don't have leftover items, consider going to GoodWill and checking out what is available there. Make some of your decorations. For instance, something that works as both a decoration and a party treat are lollipop ghosts. Or you could use super balls to stuff facial tissues, then tie them with a short piece of ribbon. These make great alternatives to candy for handouts, too. Click here to purchase 205 assorted super balls in bulk. Or, make pumpkin lollipops. Get creative. Use natural items, such as apples, pumpkins, hay bales (or even a bouquet of weeds), leaves and more to decorate your home. If you can, use items you have, so that you don't have to purchase anything. If you use your regular plates and glasses, you can avoid the cost of disposable plates and cups, too. You might even have a contest, and have the loser promise to help with the dishes. Instead of buying candy buckets or totes, sew up a simple tote using fabric you have or use old denim jeans and skirts to make the totes. Use markers or crayons to paint or color Halloween images on plain fabric totes. Make your costume rather than buying it. Many people won't have time for this one. If not, be sure to save the costumes you purchase for next year. Alternatively, if you store it carefully, you could wait till next year and sell it on eBay or Craigslist. Check out online stores for free shipping and discounts. If you are making your costume, consider what you need then look for ways to get the items at a reduced rate or even free. For instance, if you are creating a costume that needs cardboard, check with the local furniture store or appliance store several weeks before you need it, and ask them if you can have the cardboard from appliances or furniture. Ask your guests to bring one Halloween themed food item for the table. If you make a chart, you can ask different poeple to bring different types of foods, so that you don't have all cookies. We have done this for family parties. One person will bring sandwiches, another chips and sodas, another dips and veggies, etc. Then whatever someone else isn't covering is your portion. Or you can decide which you want to do, then ask them to fill in around the main dish. After Halloween, check your decorations to see if they will work for another year. If so, carefully pack them away to keep them clean and undamaged for next year. Decide if you want to use the costume again. It might be possible to reuse the costume as a different character. For instance, a long black dress used for a zombie or a witch this year might work as a vampire next year with a few changes, and different makeup and jewelry.